There are over 50 definitions of the term POD on the net. The definitions range from “seed pods” to “self-contained storage units" brand named PODS, but most definitions relate to a self contained unit of some sort. In the construction world, POD brand storage units are sometimes used to support construction. Recently the use of the term POD has emerged as a self-contained prefabricated toilet, acute or intensive care unit, and even hotel rooms. 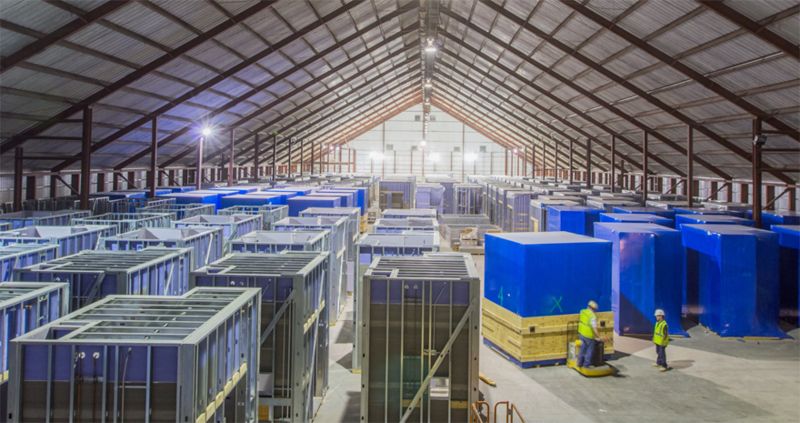 The prefabricated units are all being built offsite using manufacturing techniques best known on a manufacturing line including BIM and “on demand” manufacturing. Some claim that the use of BIM and the prefab techniques can potentially save 30-50 percent on construction schedules over a standard site built construction. Recently, I sat down with Jorge Rodriguez, a Project Executive at MAREK, an interior finishes specialty contractor headquartered in Houston with offices in Austin, Dallas-Ft. Worth, San Antonio, and Atlanta, Ga. to discuss the company’s recent experience building PODs for use in the North Tower Expansion at Houston Methodist Hospital in the Texas Medical Center. This is a $700 million, 960,000 square-foot renovation to two existing facilities and a new tower that will contain pre-op and post-op rooms to support the nearby surgery units on the Methodist campus. The contactor on the project is Phoenix based AECOM/Hunt. The architect was EYPHealth-WHR Architects located in Houston. The new tower will house 366 beds on its 22 floors and each of those, the Acute Care Unit or Intensive Care Unit rooms, will be built using prefab headwalls and bathroom PODS fabricated to exacting standards by MAREK and other trades in an offsite warehouse. 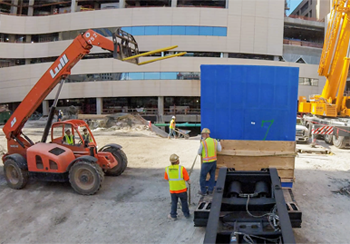 Once framed and drywalled on one side with plumbing, electrical and HVAC stub outs in place, they were inspected, fully wrapped and transported to the construction site in the congested Texas Medical Center. On site, they were lifted onto the appropriate floors, dollied into place and then connected to the building systems, inspected the final time, finished and then they became a part of the finished building. Rodriguez told me that MAREK produced 39 PODS that were placed in intensive care (ICU) patient rooms and 168 acute care (ACU) pods that are being placed in units for a total of 207 PODs. When asked about the process, Rodriguez told me that the POD construction was “relatively painless once the jigs were in place and the trades coordinated.” The potential “clashes” were minimized thru the use of BIM, accurate shop drawings and close coordination with the other trades. The only issues occurred where the construction of the structure in the field did not meet the exacting standards of the prefabrication, nothing unusual in a project this complex. Since the project is still under construction and is not scheduled to be operational until 2018, Rodriguez was not able to determine whether there was any overall schedule savings, but he anticipated that the savings from the use of the PODs would be seen in the tower construction where the PODs were being installed. We have previously written about the increasing use of prefabrication in commercial and institutional construction today. We expect that there will be an increasing demand for companies who have the ability to prefab PODs and other building components going forward. We will look for additional companies and projects that use prefabrication. Stay tuned.